Picked up 20 lug bolts for 30.00CAD from Mopar Parts Canada awhile back. I think regular price are like 10.50 apiece! One of our sponsors has them listed, Carid. I just had a flat on the our 200. No problem removing the wheel. In June, we will have owned the car for 5 years. How did you get a set of 20 for $30? 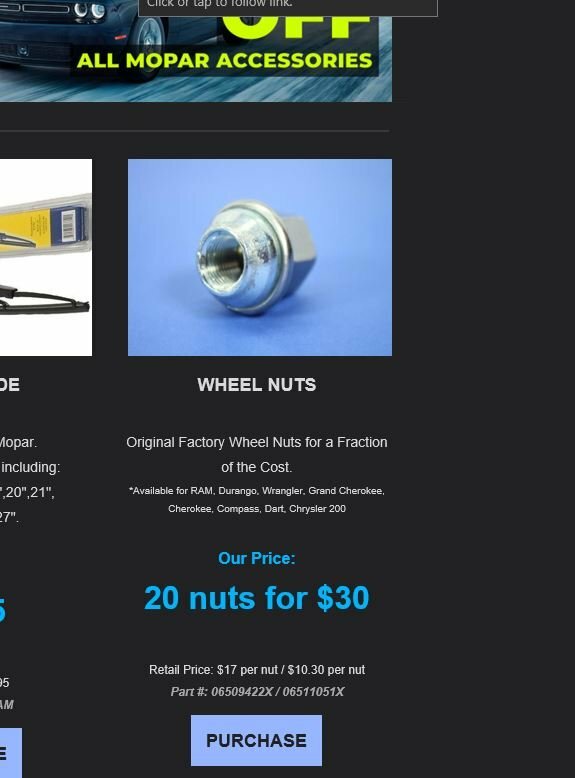 I just checked their site and they come up as $10.80 ea. They had a sale in March. I found these on Amazon US. Only problem is, they don't ship to Canada. I just ordered this set from Amazon. Being delivered to my US address in Niagara Falls NY. $34.99 US for the set of 20. I just ordered this also. Thanks for the info! Got my new lug nuts late yesterday but did not have a chance to have them installed since I didn't get home till so late from a road trip. Was about to go somewhere this morning when I found...of course...a flat tire with a huge wood screw in it. There were several large truckers I was stuck behind yesterday that were shipping house or roof trusses. Did notice clanging in my wheel well twice. Now thinking they were screws falling off of the trucks. Anyhow...I can't get the wheel off due to the original lug nuts swelled, literally cannot fit the tool on 3 of the 5 nuts. I'm going to have to pay a tow truck for towing expenses due to a flat tire. This is NOT cool. Sorry to hear of your troubles travman. Let us know how the new lug bolts fit and compare when you switch them out. I had my lug bolts shipped to my US address in Lewiston NY and my brother picked them up for me yesterday. I won't get them until my next trip down to visit him in about a month or two from now. Last edited by shamrock249; 04-14-2019 at 01:48 PM.